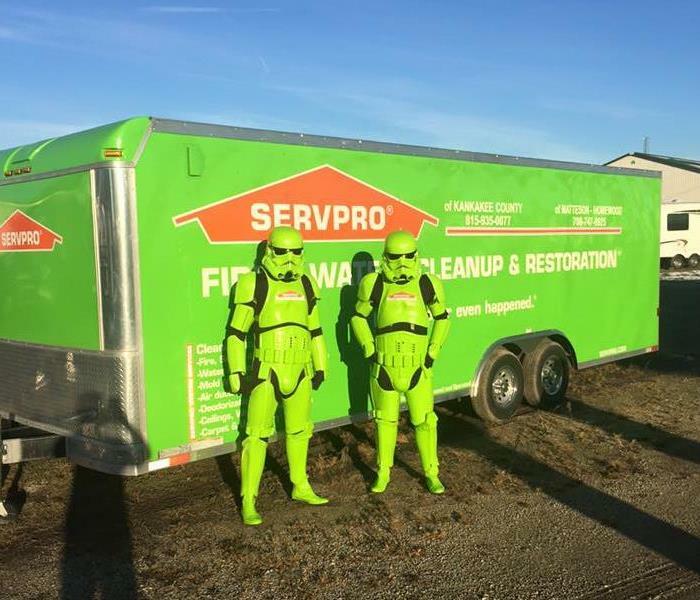 SERVPRO Storm Trooper out visiting! SERVPRO of Matteson-Homewood, Chicago Heights-Crete-Beecher, and Kankakee County participated in the Annual Bradley Lighted Christmas Parade. 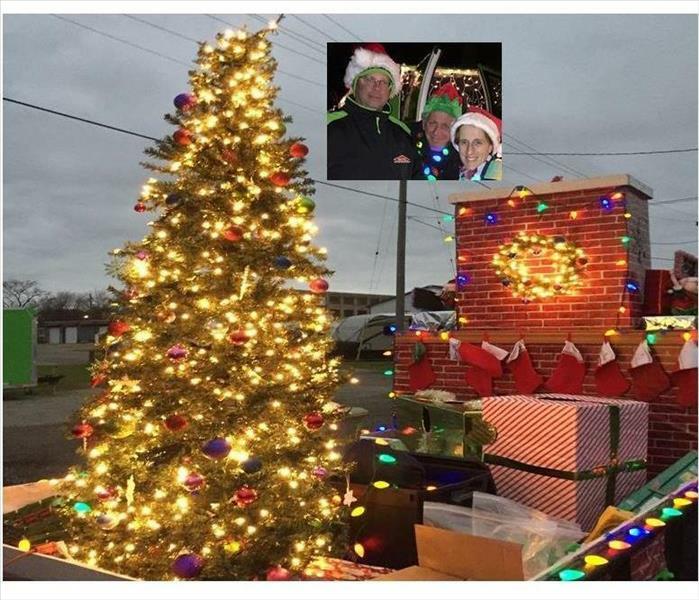 Our SERVPRO float was decorated with a lighted Christmas tree, chimney with a festive Stormtrooper, and costumed Christmas presents and elves. The three pictured Santa's Helpers are Matt Leisure, Bill Wilczynski, and Andrea Ehmen. It was great to celebrate the holiday season with our friends and neighbors. Happy Holidays. SERVPRO of Matteson-Homewood, Chicago Heights-Crete-Beecher, and Kankakee County decorated one of the Christmas trees on display at the Iroquois County Historical Society and Courthouse Museum in Watseka, Illinois. The building was completed on November 1st, 1866. On June 13, 1975 the Old Courthouse was registered as a Historic Place by the United States Department of the Interior. In the photo is Bill Wilczynski of SERVPRO and Judy Ficke of the Iroquois County Historical and Courthouse Museum. Bill Wilczcnski from SERVPRO of Matteson-Homewood, Chicago Heights-Crete-Beecher and Kankakee County attended the Watseka Park District Super Safety Saturday in Watseka, IL. The event was open to the public and emphasizes kids fire safety awareness. For more information on the Watseka Park District, visit http://www.watsekaparks.org/ The Watseka Park District is proud to serve the Watseka community by providing services such as the toddler program, after school program, summer camps, birthday parties, and much more. Our SERVPRO team is always proud to support the local community. Pictured are Bill and State Rep Tom Bennett of District 106. The recent state-wide conference's focus was directed towards how as community engagement leaders we can improve the condition of our neighbors through life-long learning programs. 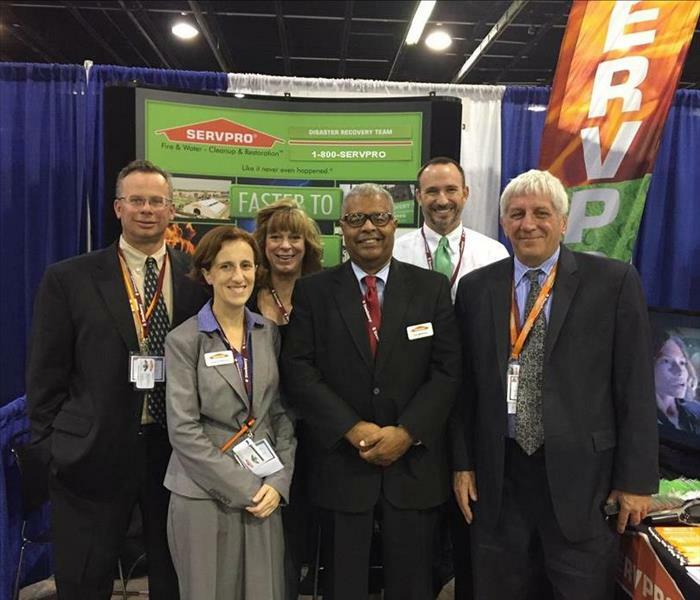 The SERVPRO of Kankakee's Sales & Marketing Disaster Recovery Team, from the left, Matt Leisure, Andrea Ehmen, Joanne Mutter, Tim Williams, Greg Stewart, and Bill Wilczynski, participated with the aim of educating our neighbors on safe responses to disasters that affect their lives and property. Call us at (815) 935-0077 and ask about our free ERP, Emergency Ready Profile, a mobile app that provides contact information to first responders and ways of safeguarding your property. 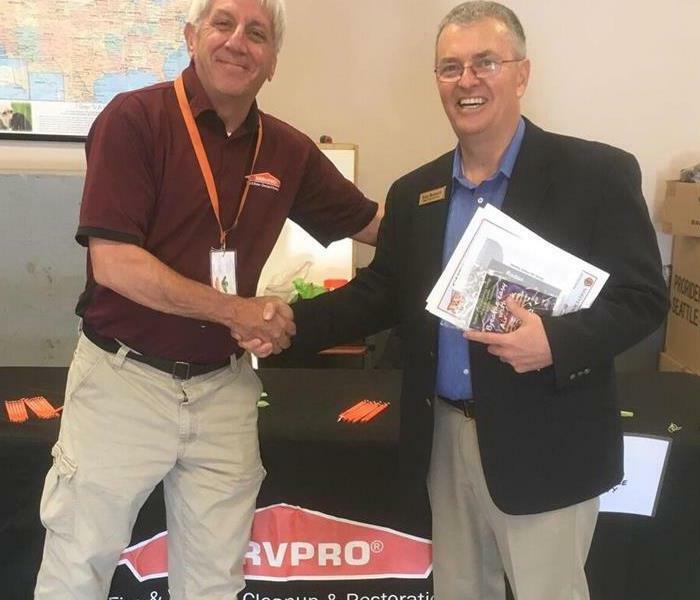 Bill Wilczynski from SERVPRO of Kankakee County, Matteson-Homewood and Chicago Heights-Crete-Beecher attended the Manteno Community Fire Protection District Open House in Manteno, IL. In the photo above is Bill and Chief Scott O'Brien. http://www.mantenofire.com/ Local residents enjoyed a tour of the fire house, learned about the fire department fleet of vehicles as well as safety tips to prevent commercial and residential fires in the Kankakee area. We are always happy to support our first responders. Fire damage can be devastating for you and your family. We are here to help in your time of need. SERVPRO of Kankakee County, Matteson-Homewood, and Chicago Heights-Crete-Beecher recently held their bi-annual Continuing Education Classes. Greg Stewart, Bill Wilczynski, Joanne Mutter, Andrea Ehmen and Matt Leisure spent the day with insurance professionals in the classes that Todd Davis, from Davis Agency, taught. The classes are offered in the Fall and Spring and help insurance professionals meet their requirements for their licensing. We gladly hold these classes to ensure our insurance professionals advise our residents on the latest means of protecting their properties and businesses from mold, fire, and water damage. Bill Wilczynski and Andrea Ehmen from SERVPRO of Kankakee County, Chicago Heights-Crete-Beecher, and Matteson-Homewood represented our SERVPRO team at the MABAS 24 Golf outing. Lincoln Oaks Golf Club in Crete hosted this golf tournament. The mission and scope of this Association are the melding together of groups to help one another under existing interactive co-operation and aid agreements. The participants enjoyed the shotgun start at 11:30, a good round of golf with on-course refreshments, and an awards dinner to conclude this important event. 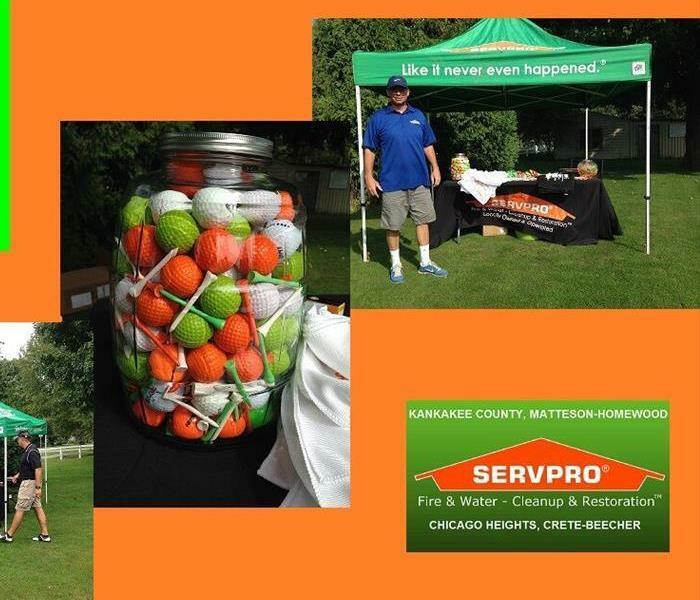 Our team at SERVPRO of Kankakee County is proud to support our locals in their time of need to any mold, fire, or water damaging event to their home or businesses. No need to schedule a "tee" time! We respond quickly, 24/7. 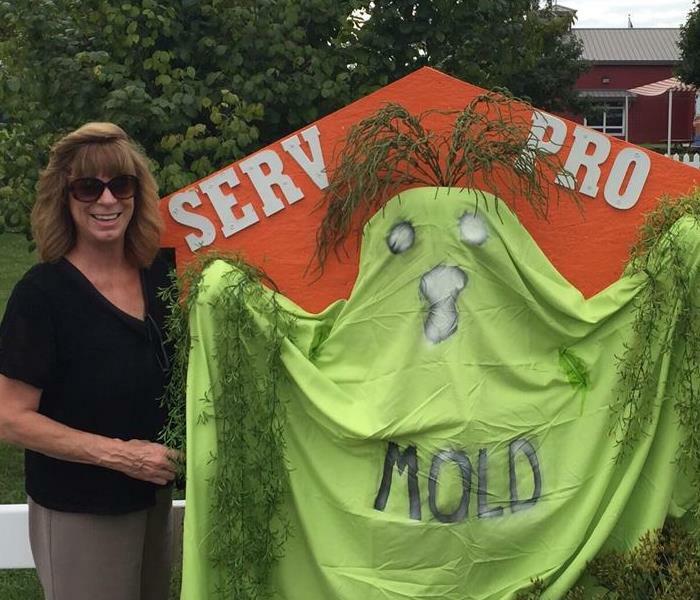 Joanne Mutter, from SERVPRO of Kankakee County, Matteson-Homewood and Chicago Height-Crete-Beecher, poses with Fun-Gi, our entry in the Scarecrow Festival presented by the Bourbonnais Township Park District. The Scarecrow Festival was held at Perry Farm. Fire, water and mold damage can be scary, SERVPRO is here to help. 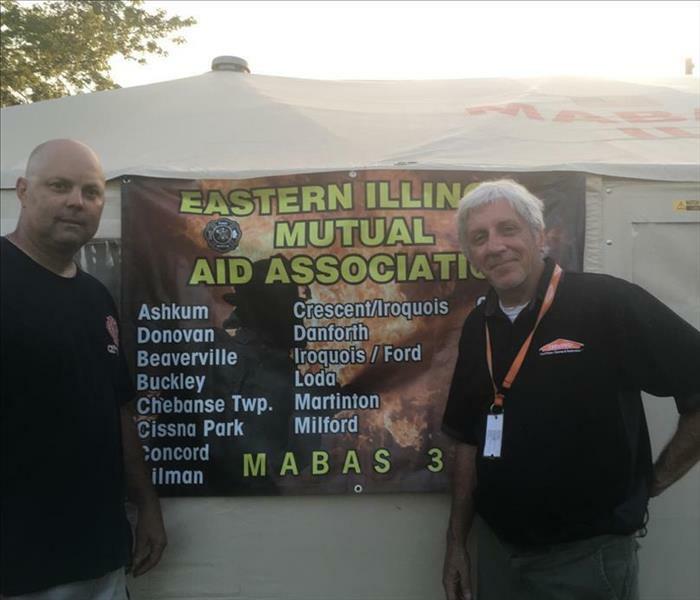 Greg Stewart, from SERVPRO of Kankakee County, Matteson-Homewood and Chicago Heights-Crete-Beecher, attended the Limestone Fire Department Chicken Dinner. A great time and amazing food was enjoyed by all. 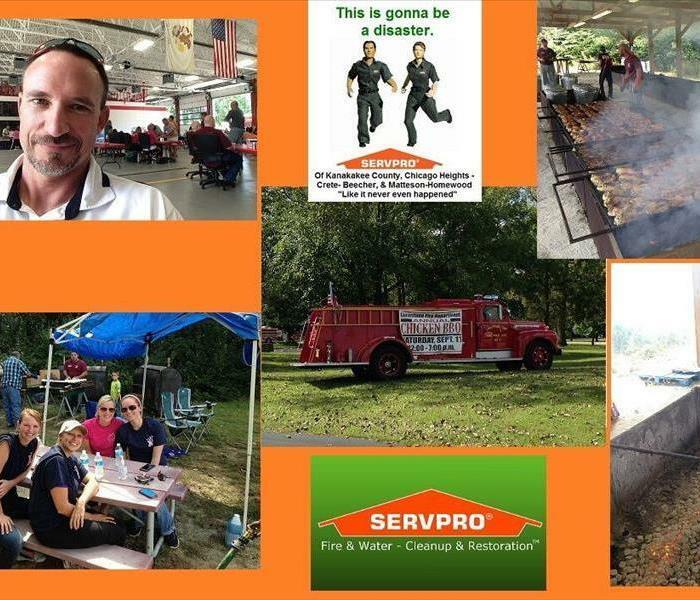 Firefighter's did all the cooking and SERVPRO was happy to support their efforts. Greg Stewart and Matt Leisure from SERVPRO of Kankakee County, Matteson-Homewood and Chicago Heights-Crete-Beecher attended the MABAS 7 golf outing at South Shore Country Club in Momence, IL. Included at the SERVPRO tent was a "Guess How Many Balls and Tees" game. The MABAS Division 7 Kankakee Valley Fire Chief’s Association is made up of 17 fire departments and 20 associate members. We are always happy to support the local community. Bill Wilczynski our Sales & Marketing Rep from SERVPRO of Kankakee County attended the Martinton Fire Protection District 9/11 Memorial Service in Martinton, IL. Pictured with Bill is the Martinton Fire Department Chief Jim Seabert. This Fire Department was established in 1948 to protect lives and property in our communities. Fire and smoke damage can be very destructive. We have the necessary equipment, desire, and training to restore your home or business to pre-fire its condition. Trust SERVPRO to help our residents. 4th of July Fireworks Display in Ashkum, IL. 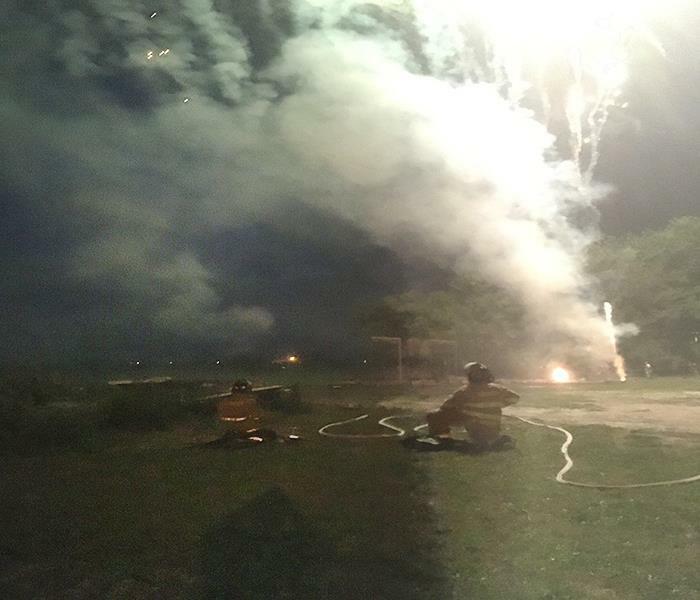 Bill Wilczynski from SERVPRO of Kankakee County, Matteson-Homewood, and Chicago Heights / Crete / Beecher was invited by Chief Jeff Glenn, from the Ashkum Fire Department and President of MABAS 37, for a front row seat with the Ashkum Fire Department during the 4th of July Fireworks Display in Ashkum, IL. 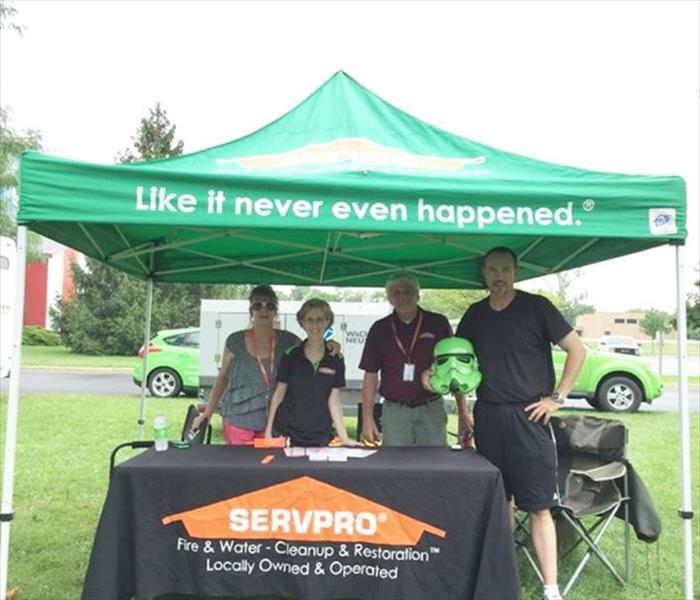 "The Return of Field Day"
The SERVPRO Stormtroopers were out to support "The Return of Field Day" event at St. George School in Bourbonnais. The director of events, Lori Flattery, took time to mug for a photo while the Stormtroopers helped get the kids fired up for the day. Our Large Loss & Response Team is always ready to save the universe, one student at a time. 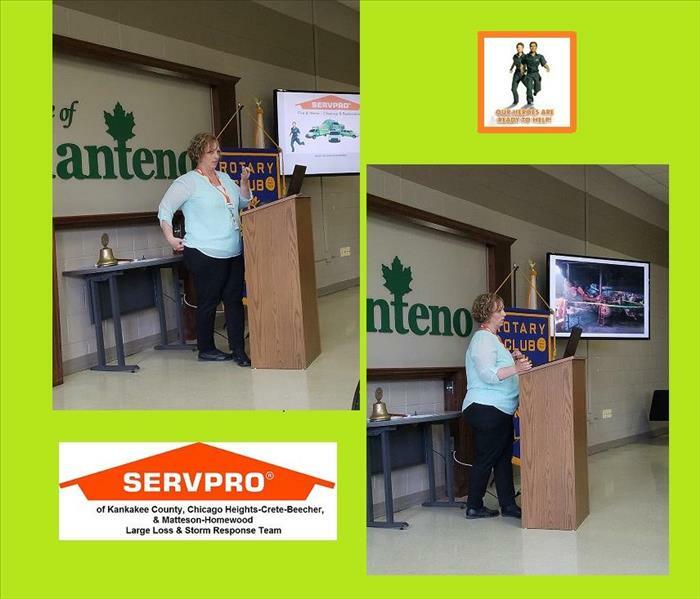 Diane Logerquist from SERVPRO of Kankakee County, Chicago Heights-Crete-Beecher, and Matteson-Homewood got the chance to speak with the members of the Manteno Rotary Club. 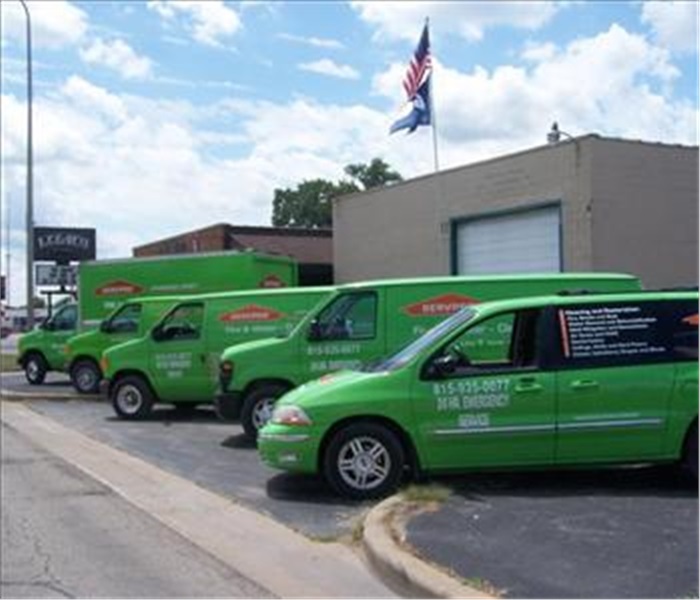 SERVPRO can offer our restoration and cleaning services to commercial businesses, large and small. We always answer the bell to help out our local enterprises instantly in their hour of need. By offering advice and information, we try to keep our businesses up to date with our latest techniques to mitigate any damages they may incur from mold, fire, or water. 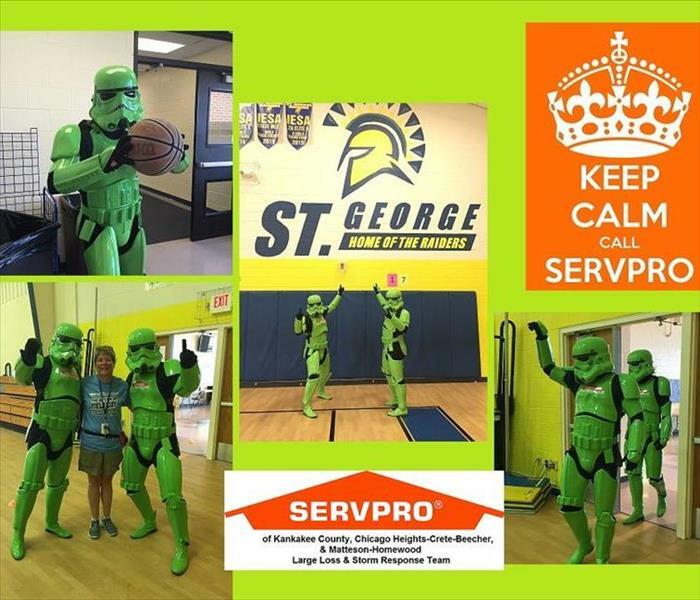 The SERVPRO Stormtroopers made a guest appearance at St. George Community Consolidated School in Bourbonnais, IL on Wednesday, May 25th for the school's "Return of the Field Day" end of the year celebration and activities. Bobby Nichols and Greg Stewart walked through the gym dressed in the popular costumes giving high fives and posing with kids and teachers in Kindergarten through 8th Grade. Greg Stewart and Diane Logerquist of SERVPRO of Kankakee County are out supporting the Manteno Chamber of Commerce 2016 Golf outing. Beautiful weather and a packed course made for a great way to spend the day supporting local businesses. The Marketing team of Greg Stewart, Joanne Mutter, and Jennifer Seely are out in support of the Presence Our Lady of Victory Golf Outing today at the Kankakee Country Club. Joanne and Jennifer are cheering on golfers on the 3rd hole as they try for the Hole In One Challenge Sponsored by Court Street Ford. We are proud to support the local community. SERVPRO of Kankakee County wishes you a Happy Star Wars Day. May the 4th be with you! In the photo, you see several of our vehicles and our tent at the "Firefighter Challenge" event, organized by the Illinois River Valley Chapter of the American Red Cross. The Firefighter Challenge is a competition between firefighters competing in individual and team events. This year the event was held in Kankakee, at Ice Valley on River Road. We're proud supporters of our local Red Cross organization and our local fire department. Twice a year, we at SERVPRO of Kankakee County offer continuing education classes for all of our insurance agents. 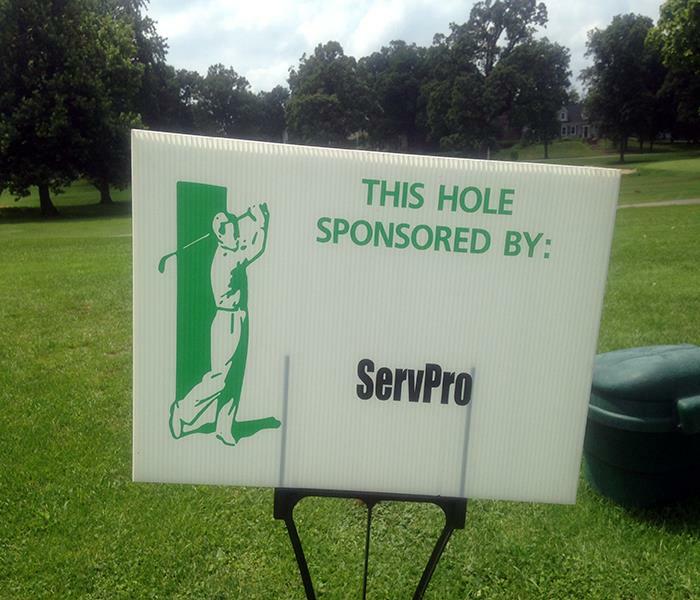 SERVPRO of Kankakee County & Matteson-Homewood sponsored a hole at Glenwoodie Golf Course in Glenwood, IL for M.A.B.A.S 24. 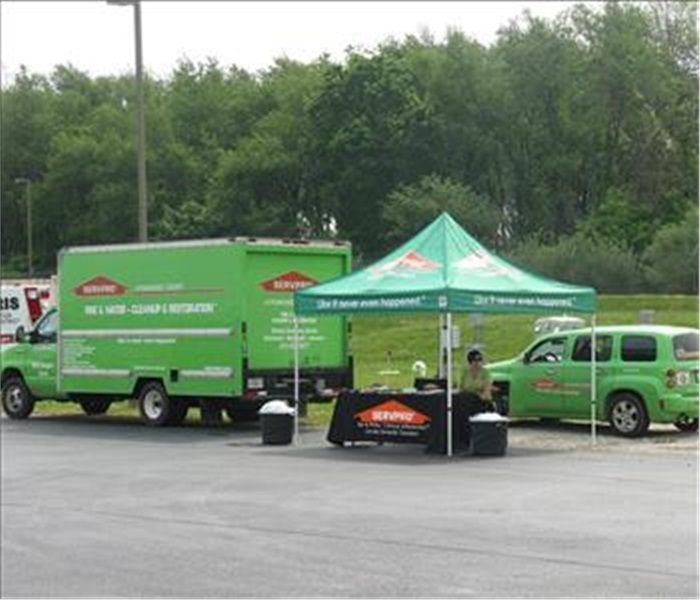 SERVPRO of Kankakee County's event table at the Fire Training Academy. 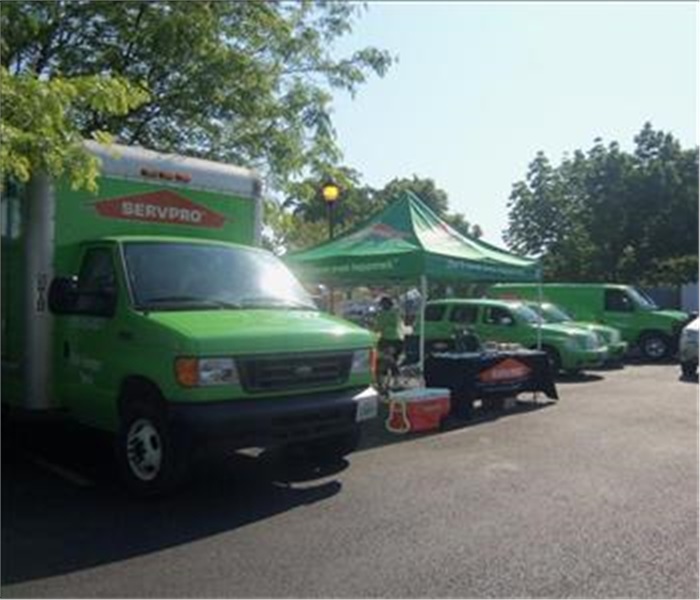 SERVPRO of Kankakee County every year donates snacks and beverages for each House Burn Training event. 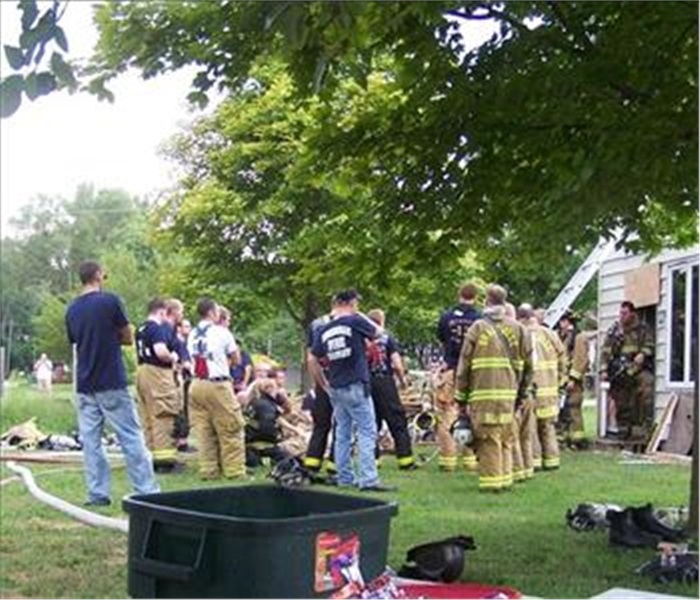 Pictured are firefighters from multiple fire departments listening to their Trainer give instruction before entering the home. The Firefighter's Golf Outing is a fun filled event every year that SERVPRO of Kankakee County is proud to be a sponsor of. SERVPRO of Kankakee County & Matteson-Homewood line up to welcome home our local troops in Bradley, IL. 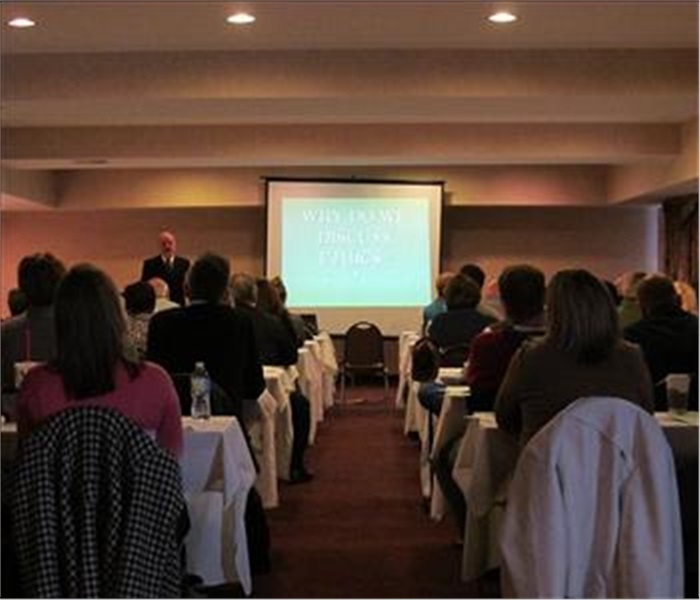 Class Instructor engages local Insurance Agents in South Holland, IL for their required Ethics class. SERVPRO of KANKAKEE & MATTESON-HOMEWOOD added additional instruction on Fire, Mold, & Water Damage. 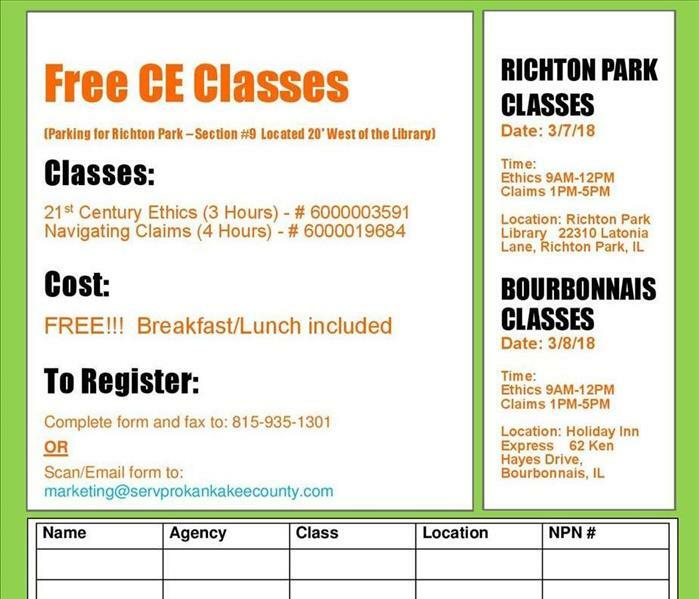 Class Instructor engages local Insurance Agents for their required Ethics credits in Bourbonnais, IL SERVPRO of KANKAKEE & MATTESON-HOMEWOOD added additional information about Fire, Mold, & Water Damage. We have a great partnership with the Speedway and enjoy sponsoring the kids club at the Kankakee County Speedway. Photo from Family fun-a-thon event, February 7-8, 2015. It was attended by Chuck Parrish and Danielle Kozlowski present center left in the picture. Greg Stewart and Diane Logerquist participated in the 2016 Family-fun-athon, held at Olivet Nazarene University. They helped children and parents alike play a version of Bozo Buckets, where gift bags were handed out and participants who made all 6 buckets were able to pick from the "Special" prize bucket. SERVPRO of Kankakee County are pleased to announce our becoming members of the Manteno Chamber of Commerce. The chamber host numerous events throughout the year and focuses on growing local business relationships. Storm Troopers Joanne Mutter & Bill Wilczynski, along with the rest of the marketing team of Greg Stewart, Jason Smith, & Diane Logerquist, helped spread holiday cheer with our outreach to a local Day Care facility. Children and staff had a great time mugging for photos. "The 3rd Annual Haunted Factory"
Come one and all to explore multiple levels of the old factory. See what walks the floors and lurks in the shadows, if you dare!!! SERVPRO of Kankakee County hosts another round of successful CE classes for area Insurance agents. SERVPRO of Kankakee County offers two rounds of CE classes during the calender year, with two classes offered each time. SERVPRO of Kankakee hosts another successful round of CE classes for our area Insurance agents. On June 11, 2014 SERVPRO of Kankakee attended the Kankakee Valley Park District ribbon cutting ceremony for the new Recreation Center. The city of Kankakee was given a 2.5 million dollar grant to build the new facility. 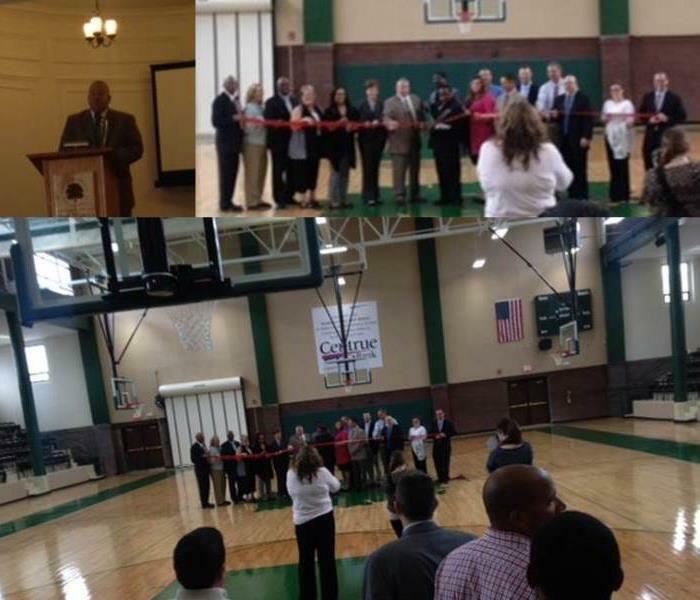 SERVPRO of Kankakee was able to contribute to the ceremony by cleaning the gym floor. 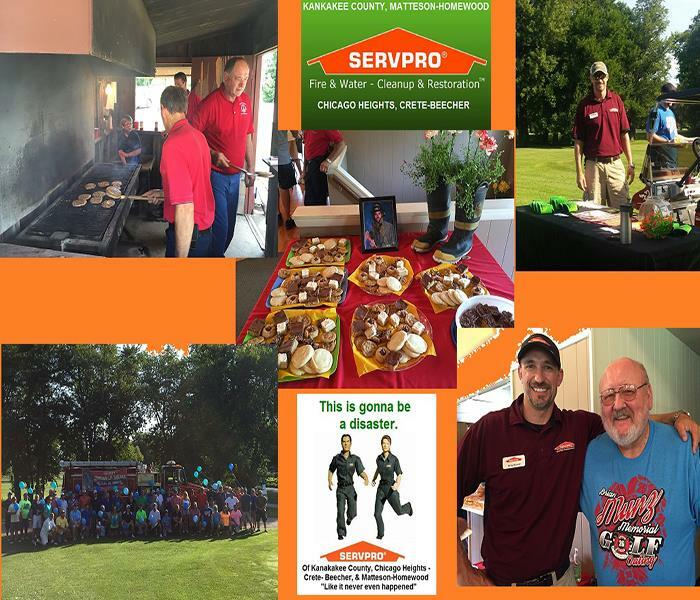 SERVPRO of Kankakee is a proud sponser of the Pause for Patriotism – Kankakee, IL. Event. We set up a booth played bags, had some giveaways and a good time was had by all. Bill Wilczynski from SERVPRO of Matteson-Homewood, Chicago Heights-Crete-Beecher, and Kankakee Country attended the Doranita Tyler American Family Insurance Agency Open House in Lynwood, IL on Friday, July 15, 2016. 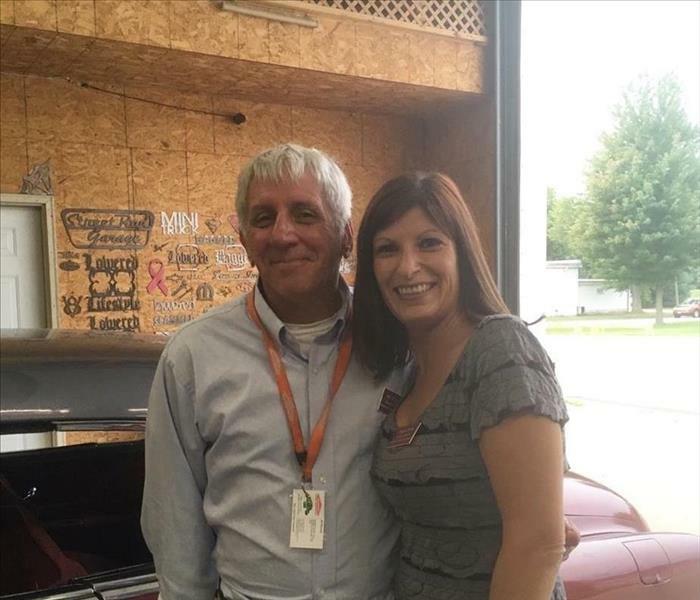 Pictured in the photo are Bill Wilczynski (SERVPRO) and Doranita Tyler (American Family Insurance). Our team member, Bill Wilczynski from SERVPRO of Kankakee County, Matteson-Homewood, and Chicago Heights-Crete-Beecher assisted in setting up the cooling tent at the Iroquois County Fairgrounds on Wednesday, July 20, 2016. Bill Wilczynski from SERVPRO of Kankakee County, Matteson-Homewood, and Chicago Heights / Crete / Beecher enjoyed the Fireman's Association Chicken Dinner on Sunday, July 24, 2016, at the American Legion Hall in Grant Park, IL. 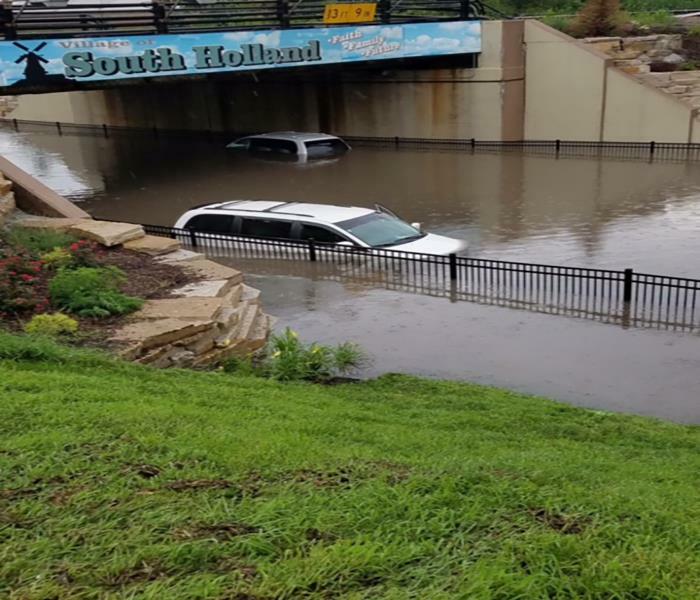 Friday, July 29, 2016, South Holland was hit with heavy rains that caused major flooding. The flooding was problematic, especially for cars. Several cars were stalled under a bridge submerged in water. Bears Training Camp 2016 got underway with special guest speakers Jim Schwantz, Mayor of Palatine and former Bears player, and Jay Hilgenberg the former "Center" of attention for the Bears. They discussed this year's team and answered questions from fans that were in attendance. Brian McCaskey made a special presentation to Dr. John Bowling as a gesture of good will and hospitality between the Chicago Bears organization and Olivet Nazarene University. The annual fundraiser for Bears Care was held in addition to a special fundraiser to assist the Olivet Tigers Football team which gets displaced during Bears Camp. Greg Stewart from SERVPRO of Kankakee County, Matteson-Homewood, Chicago Heights-Crete-Beecher was in attendance for support of both organizations. We proudly contribute to our local communities and cheer for Our Chicago Bears. SERVPRO of Kankakee County is heading out to help the families affected by the flooding that happened on Friday, July 29th. Our team at SERVPRO took care of eight families today. Jennifer Seely and Joanne Mutter from SERVPRO of Chicago Heights-Crete-Beecher, Matteson-Homewood, and Kankakee attended the Sauk Village Fire Department Golf Outing on Saturday, July 30, 2016, at Lincoln Oaks Golf Course in Crete, IL. National Night Out is the coming together of citizens, law enforcement agencies, business and civic groups, local communities and youth organizations to celebrate our commitment to crime prevention and public safety. You can visit the site here for more information. Members of our SERVPRO of Kankakee County Team are pictured here: Joanne Mutter, Andrea Ehmen, Bill Wilczynski and Greg Stewart at Perry Farm. We proudly contribute in many ways to ensure the well-being of our local residents. 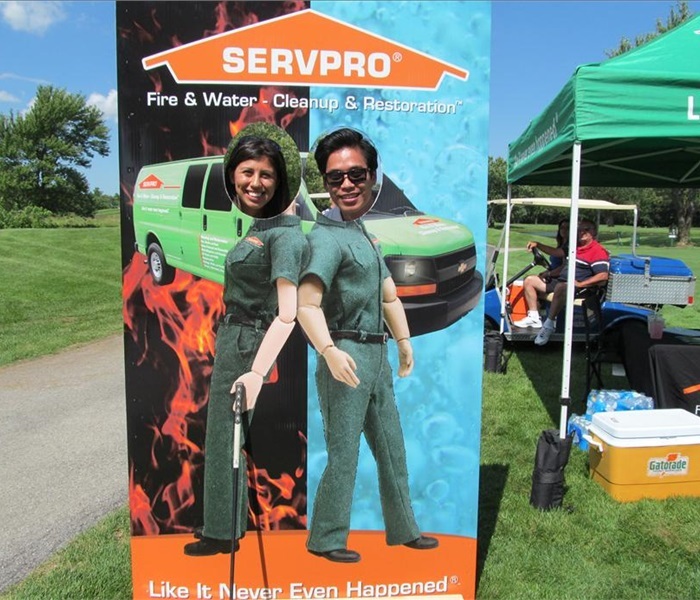 SERVPRO of Chicago Heights-Crete-Beecher, Matteson-Homewood, and Kankakee sponsored a hole at the Sauk Village Fire Department Golf Outing on Saturday, July 30, 2016, at Lincoln Oaks Golf Course in Crete, IL. Greg Stewart from SERVPRO of Kankakee, Matteson-Homewood, and Chicago Heights / Crete / Beecher and Chief LeRoy McPherson of the Fairbury Fire Department recently participated in the 8th Annual Brian Munz Golf Outing, held at Indian Creek Country Club in Fairbury, IL. 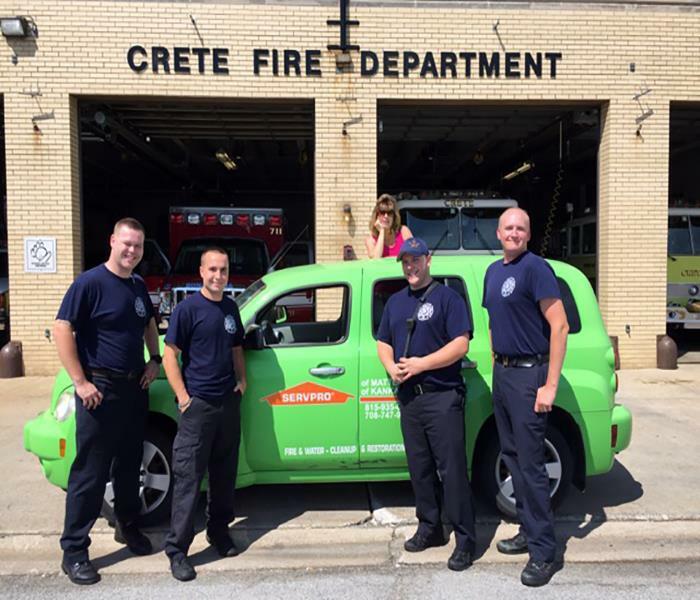 SERVPRO of Kankakee County was honored to donate a vehicle for training purposes to the Crete Fire Department this week. Pictured are Joanne Mutter from SERVPRO along with Crete Firefighters Pat Smith, Nick Carollo, Kyle Haemker, and Kevin Leroy. After the fire department has put out the fire, our team of highly trained professionals will use state of the art technology to tackle the fire damage. 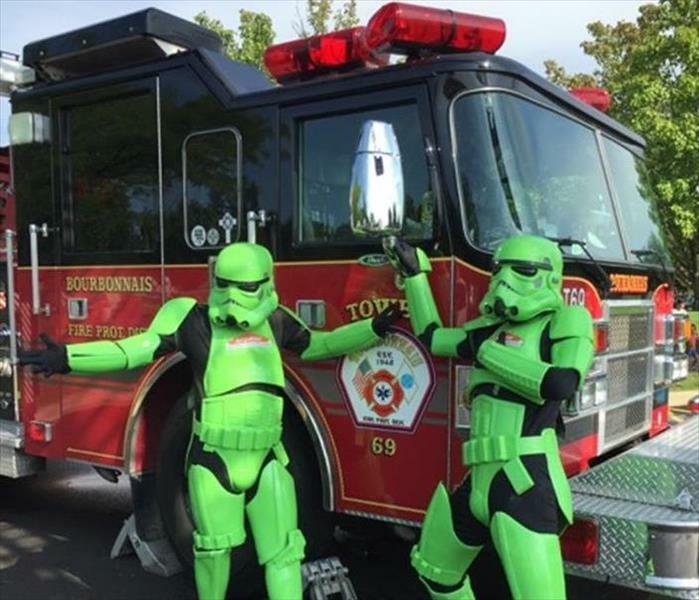 Pictured are two of our World Renowned Storm Troopers from SERVPRO of Kankakee County. They are hanging out by a Bradley fire truck at National Night Out 2016 and appear ready to put out any fire that may occur to your home or business. Our green vehicles and green men help to serve and protect our local communities. 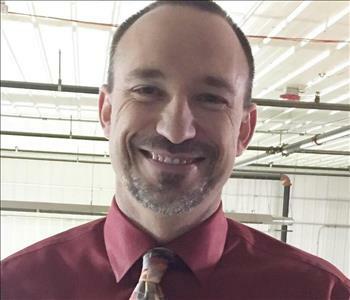 The Watseka Area Chamber of Commerce offers this program, BAH, Business After Hours, as a backdrop for local businesses and civic organizations to network and provide a sense of community to the Watseka locals. Amanda Hibbs, Executive Director of the Chamber, is posing with Bill Wilczynski, our Sales & Marketing Rep from SERVPRO of Kankakee County. This BAH was recently hosted by Nichols Paint & Fab and was attended by over 35 Chamber members. We are proud to support our local businesses, offer educational classes to our civic associations, and assist our neighbors in their hour of need. SERVPRO of Kankakee County has decided to donate our Chicago Bears season tickets to police officers and their families. Each week, we will reach out to local officers serving our communities and neighborhoods to offer our Chicago Bears game tickets to them. Each set of tickets will be delivered with two Blue Ribbon SERVPRO magnets. Our entire team is proud to be an active member of our local community. We live here, work here and play here. As a trusted leader in the restoration industry, we know how important first responders are. We hope to make their day a little brighter. Go Bears!